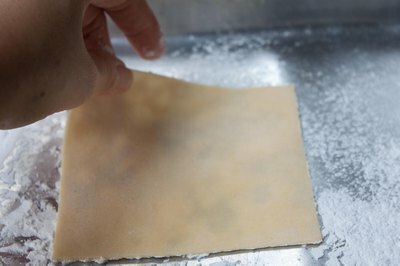 Like most forms of pasta, wonton wrappers are especially tender and supple when they are made fresh. You can make fresh wrappers at home with just a few basic ingredients, customizing the size of the wrappers to suit your purposes. Although the homemade wrappers might not be as uniform as store-bought versions, their imperfections are usually undetectable when the wrappers are filled and cooked. 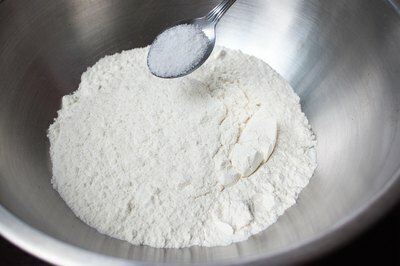 Mix all-purpose flour and salt together in a large bowl. Use about a teaspoon of salt per 1 1/2 cups of flour. 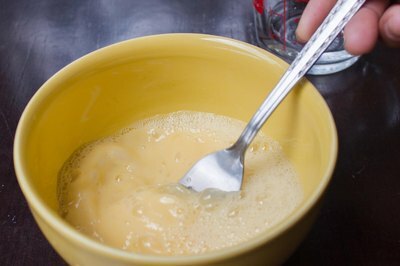 Beat the egg with water in a small bowl. Use about 1/4 cup of water and 1 egg per 1 1/2 cups of flour. 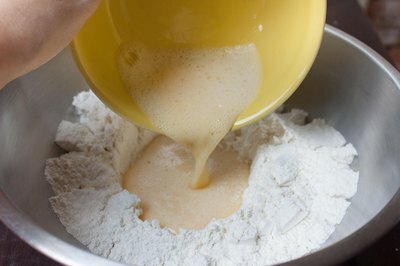 Make a well in the flour mixture. Pour the wet ingredients into the center. 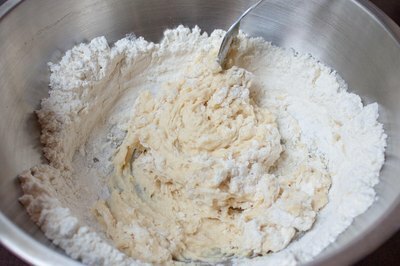 Stir the liquid, using a fork so that the dry ingredients incorporate gradually and form a shaggy ball of dough. The dough should be slightly sticky, but not wet. Add a little more flour or water to correct the moisture level, if necessary. 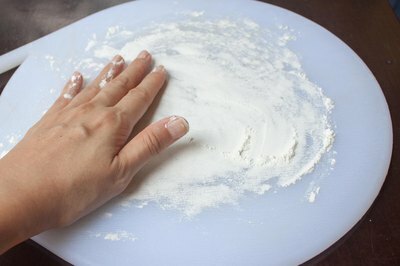 Dust your hands and a flat work surface with flour. Transfer the dough onto the work surface. Knead the dough until it is smooth and elastic -- about 10 minutes. Use a dough scraper to help lift the dough from the work surface. 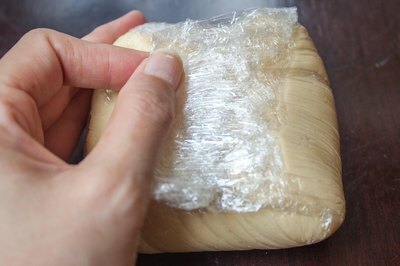 Wrap the dough in plastic wrap and let it rest at room temperature for an hour. Alternatively, store the dough in the refrigerator for up to one day. 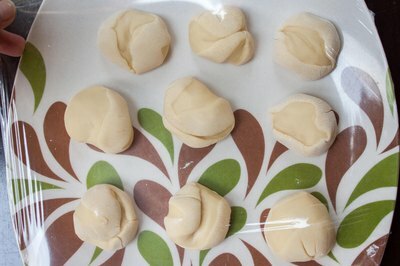 Bring refrigerated dough to room temperature before rolling it. What Are Wonton Wrappers Made Out Of? Divide the dough into pieces about the size of golf balls. Work with one piece at a time, keeping the others covered with plastic wrap to prevent them from drying. Dust your work surface with cornstarch. Start rolling the dough into a rectangle. After each few passes with the rolling pin, loosely drape the dough over the rolling pin to lift it. Dust the work surface with more cornstarch. 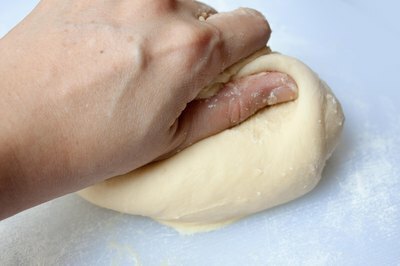 Roll the dough until it is thin enough to let light pass through. Use a ruler and a sharp knife to cut the dough into uniform squares. The standard size for wonton skins is about 3 inches wide. Transfer the squares onto a baking sheet dusted with cornstarch, and use a sheet of parchment paper between stacked layers. Keep the wrappers covered with a kitchen towel until you are ready to fill and cook them. 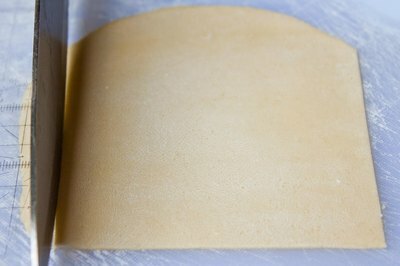 For a more uniform thickness, use a pasta machine to roll out the dough. 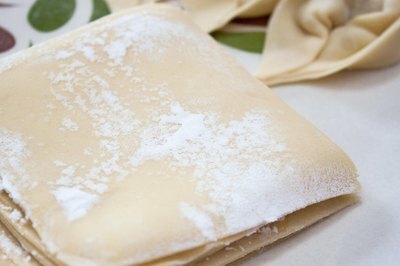 Store extra wonton wrappers in the refrigerator for up to 3 days, or in the freezer for up to 3 months. Fresh wrappers might develop a harmless grayish tint over time if you store them in the refrigerator. 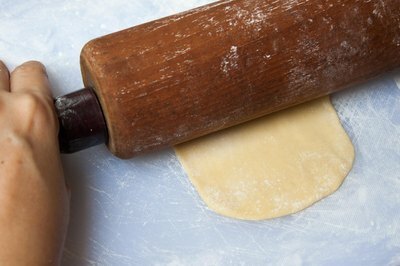 Because the fresh wonton dough contains raw egg, it's best to avoid keeping the dough at room temperature for prolonged periods of time. According to the USDA, eggs should not be stored at room temperature for more than 2 hours in order to prevent the growth of bacteria.